A few summers ago, my family and I were on a driving vacation when our vehicle broke down in a pretty small town in Minnesota. I was able to find a repairman who could fix it, but we were going to be there most of the day. The town didn’t look too promising from what I had seen of it to that point, so I had resigned myself to a pretty boring day just watching the kids playing at a park. As we were strolling down a street, I happened to see a visitor’s center for this town. We poked our head inside. Within five minutes, we had found several interesting things to do without even talking to anyone. We found them from the brochure stand alone. When the person working at the visitor’s center arrived, she helped us identify some of our best options. We wound up spending a wonderful day in this little town, seeing a lot of interesting free exhibits and visiting a beautiful little park that was tucked away on a back street that we would have never otherwise found. When we got home from our trip, I made it a point to stop by the visitor’s center in several towns near our own. I wanted to find out what things those communities held that I didn’t know anything about. I spent an afternoon doing this. By the end of that afternoon, I had such a pile of brochures and notes from my stops that we still have things left undone, years later. Nature trails, museums, hidden parks, quiet little exhibits – the towns around us were quietly loaded with these things. Even in towns where you might expect to find a fair amount of interesting history or things to visit – like Nauvoo, IL, as depicted in the visitor’s center picture above – a stop at a visitor’s center can uncover a lot of things you never expected to find. I’m making two specific suggestions. 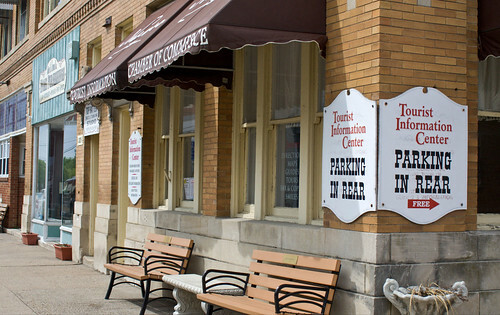 First, check the visitor’s center in the town you live in, as well as the center in nearby towns. Unless you’re incredibly well-grounded in your community, the visitor’s center will help you find a lot of things you didn’t know about – parks, walking trails, historical exhibits, cultural attractions, and so on. Second, if you’re in an unfamiliar place for more than a few hours, check the visitor’s center there. They’ll help you identify interesting and worthwhile activities with which to fill your visit to that area, most of which will be items that you were previously unaware of. Visitor’s centers can be a great resource for people who want to discover more about their community, get frugal assistance while traveling, or just find interesting free things to do.